For years, we've believed the urban legend that Star Trek: The Next Generation violated Sherlock Holmes' copyright... but according to the Arthur Conan Doyle estate, it's not true. 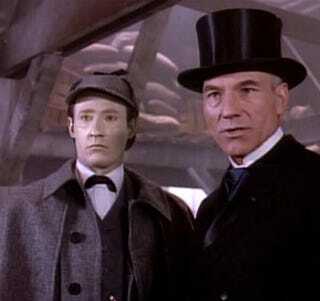 A pervasive urban legend says that Star Trek: TNG wrongly believed that Sherlock Holmes was already in the public domain when the show made its second-season episode, "Elementary, My Dear Data." And then, once Paramount/Viacom realized its mistake, the story goes, the show reached a settlement with the Conan Doyle estate and paid handsomely to reuse Holmes villain Professor Moriarty in a followup episode. This urban legend is all over the net, and we helped to perpetuate it last week with our post about plagiarism in science fiction. But according to Jon Lellenberg, an attorney who's served as the U.S. agent for the Conan Doyle estate, it's not true at all. In fact, Paramount had worked with the Conan Doyle estate on the Stephen Spielberg-produced movie Young Sherlock Holmes. So Paramount's rights department was already well aware that Holmes was not in the public domain, and they contacted the Conan Doyle estate in advance, seeking permission to dress Data as Holmes and feature Moriarty. The Conan Doyle estate was happy to agree, in exchange for a handsome payment. So when does Sherlock Holmes actually become public domain? Not until 2023, says Lellenberg.